Terroir is the result of distinct geo-historical and microclimatic features. And the reason why two wines of the same variety can be so different in taste. When the primal ocean retreated around nine million years ago, clay and lime were piled up in criss-cross layers. Rivers and winds carried in gravel and sand, modelling hill after hill of today’s Südsteiermark. A wide variety of soils were built up, which – together with the micro climate of each site – now leave very distinct traces in the wine. 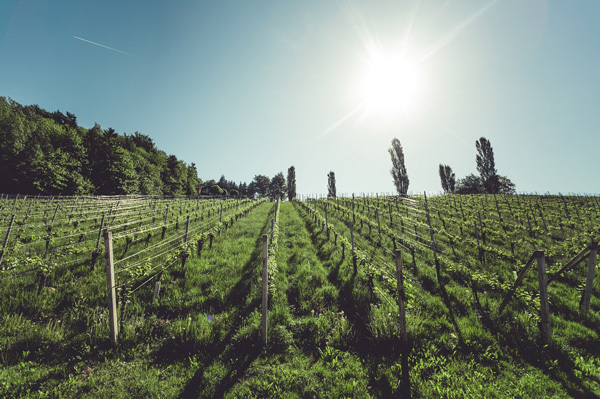 Ried Nussberg, Ried Witscheiner Herrenberg, Ried Sulz, Ried Perz, and Ried Kittenberg are our top-rated vineyard sites. The interplay of topography, soil, and microclimate lends the wines from these sites their unique terroir. Single-vineyard wines have their own origin-specific character and a high potential for aging. Our single-vineyard wines are given all the time they need to mature in order to develop their terroir in the best possible way. Together with the other STK wineries we have set the quality requirements for wines from “Große STK Ried” sites – the highest quality level STK wineries have to offer; they must be left to mature for 18 months before they can leave the cellar; wines from “Erste STK Ried” sites are sold no earlier than May of the year after harvest. Much like the surface area of these sites, their yield is also limited: each bottle of these wines is as special as the piece of land where its grapes were grown. 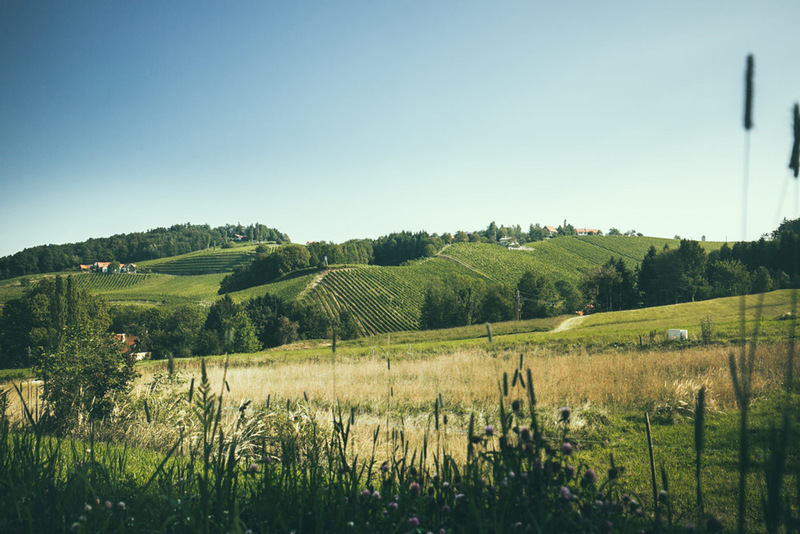 Our winery is nestled between the slopes of the Nussberg site. Here we welcome our guests and our most precious wines are grown here. The Nussberg is located at the heart of our work and life. A home base with outstanding local conditions. 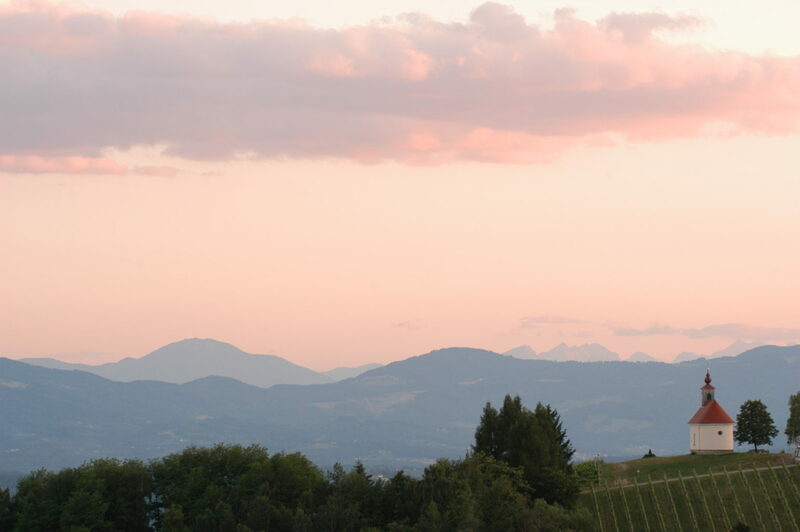 Ried Nussberg is a south- to west-facing vineyard site located at 370 to 460 meters of altitude. It flanks the bowl-shaped basin of Ratsch on one side, which we have divided into two sub-sites: the south-west-facing “Pretschnigg” site, an up to 85% slope, and a site called “Leitn” facing south and inclined up to 50%. The soil formations on the Nussberg are highly diverse: while the sub-site “Pretschnigg” is mainly made up of a sandy limestone, “Leitn” has more opok (limey marl). Another small area bears only lime-free clay and a precipitous, terraced flank even possesses soils of Volcanic origin. The Nussberg is situated in the bowl-shaped basin of Ratsch with a warm micro climate. The sub-site called “Leitn” is protected by the opposite flank and exposed to the sun starting early in the morning. “Pretschnigg” on the other hand soaks up the last sun beams of the day, reflecting them with a glow to the other side of the basin. As this site is open to the west facing the Koralpe mountain, it benefits from a nice and cool draft in the early evening hours. 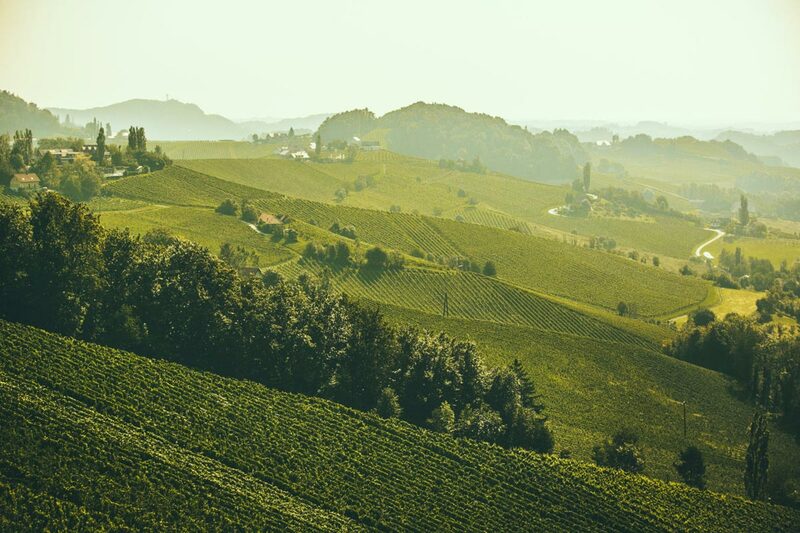 Nussberg is among the most reputable wine-growing sites in Styria and has been known under its current name since the 15th century. Ever since that day, and perhaps even longer, the site has been used for growing grapevines. 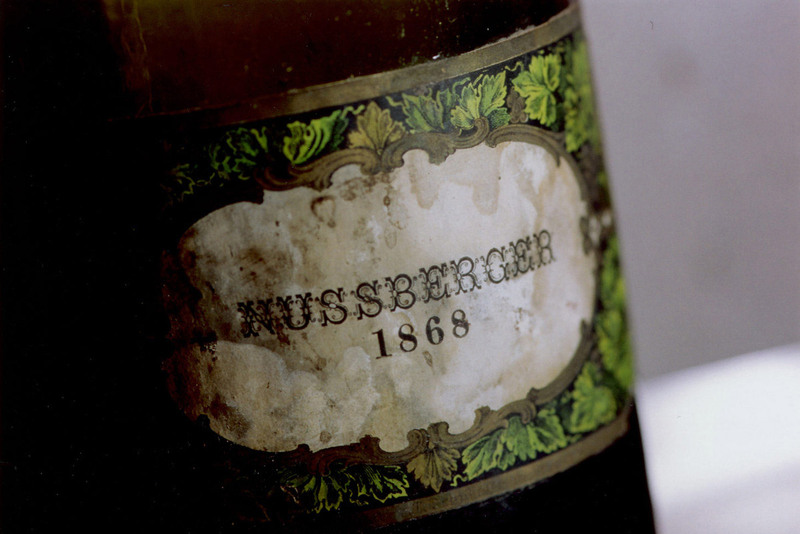 In 1986 we managed to buy the Nussberg site, and together with it a bottle of “Nussberger” wine that the previous owner had left behind in the attic: its label is from 1868. As wines in those days were hardly ever filled in bottles, and even less sold with a lavish label, it is a rare item for the entire region. It was here that our ancestors began to grow wine more than a hundred years ago. 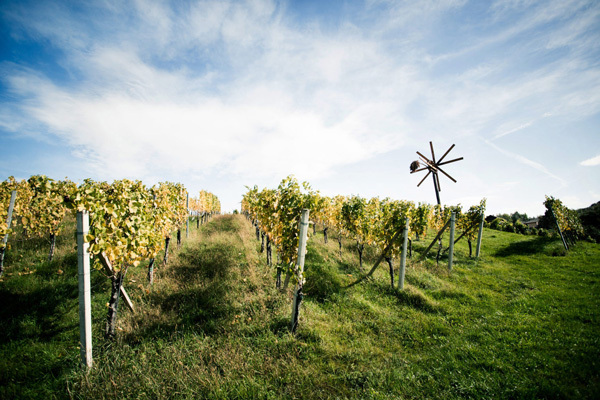 Witscheiner Herrenberg, the first vineyard owned by our family, is now located in the viticultural area of Štajerska Slovenija. It is the same site that yielded our first bottled single-vineyard wines in 1984, its grapevines are now 50 years old or older. Ried Witscheiner Herrenberg is up to 60% inclined, a very steep south-east facing site located at altitudes between 415 and 465 meters. The austere Opok (limey marl) soil of Witscheiner Herrenberg includes lumps of dolomite. The grapevines are exposed to the sun starting very early in the morning. At night, the site cools down sooner than others due to its east-facing orientation. The grapes thus take more time to ripen. The site is named after the village of Witschein (Svecina) and today located on Slovenian soil. When Heinrich Gross purchased it back in 1907, it was the first step toward our winery as we know it today. This steeply inclined vineyard has meanwhile been cultivated by six generations of our family. 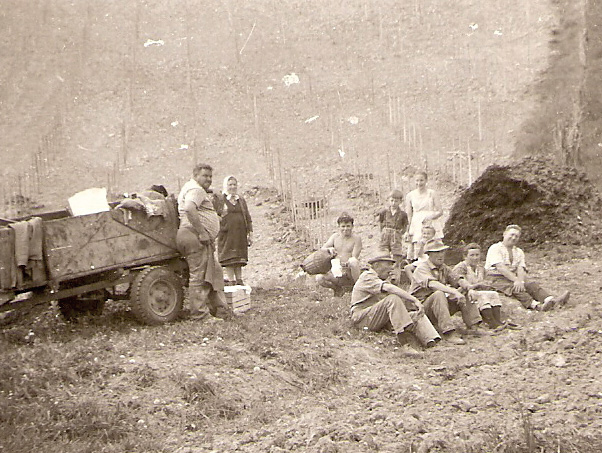 Due to a bilateral agreement signed in 1953, wines from this site on the Slovenian border can be sold as quality wine in Austria, which makes them a true rarity. Ried Perz is adjacent to the Nussberg site, but rather different in geological terms. A former riverbed made up of clay and sand, Perz is completely lime-free and ideal for growing Muscat Blanc à Petis Grains. Its delicate berries are dried by the rising sun in a location with good air drainage, which also supports fruit maturation. Perz is a south-east facing ridge located at an altitude of 410 to 470 meters and open to all sides. Its up to 64% slope is rather moderate compared to our other wine-growing sites. Ried Perz once was a river bed with sand banks up to seven metres high. The remaining sediments are composed of lime-free clay and sand with gravel inclusions, the ideal site for the Muscat Blanc variety. Due to its total exposure on all sides, Ried Perz boasts a very favourable micro climate. The Muscat Blanc grapes benefit from the early morning sun and constant wind up there, which dries up moisture in a wink. A delicate variety and highly sensitive to the sun, the grapes are also spared from the afternoon heat. The name Perz goes back to a former owner. 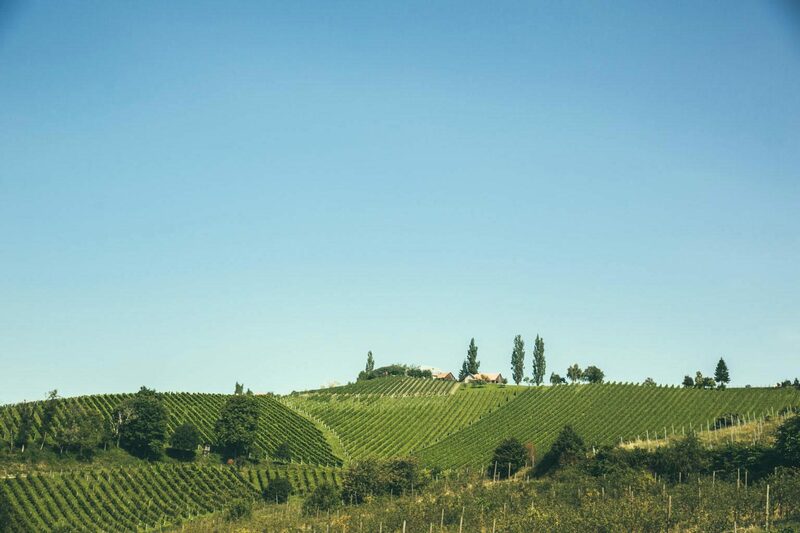 The leased site directly adjacent to our Nussberg vineyards has been cultivated by our winery since 1991. 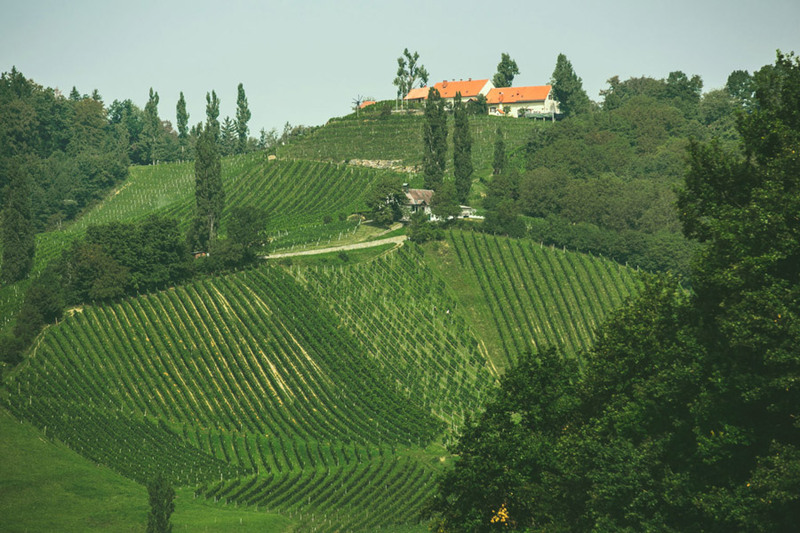 With a surface area of 100 hectares, Sulz is among the largest viticultural sites of Südsteiermark. Much like other outstanding sites, it was divided into a Slovenian and a South-Styrian portion. It is no surprise that reputable wineries purchased vineyards in this privileged location. Warm and ripe aromas are the leitmotif of all wines from this site. The oldest wines in our private archives were all grown here. Their characteristic origin often shines through in a blind tasting. Ried Sulz is a south-facing site sheltered from the Alpine climate in the west and open to the east. Its vineyards are located at altitudes ranging from 370 to 450 meters, with inclinations up to 50%. The soil here is composed of Opok (limey marl) honeycombed with conglomerate and sandstone. The combination between a heavy chalk-bearing clay and conglomerate yields a wine with citrus and many floral tones. 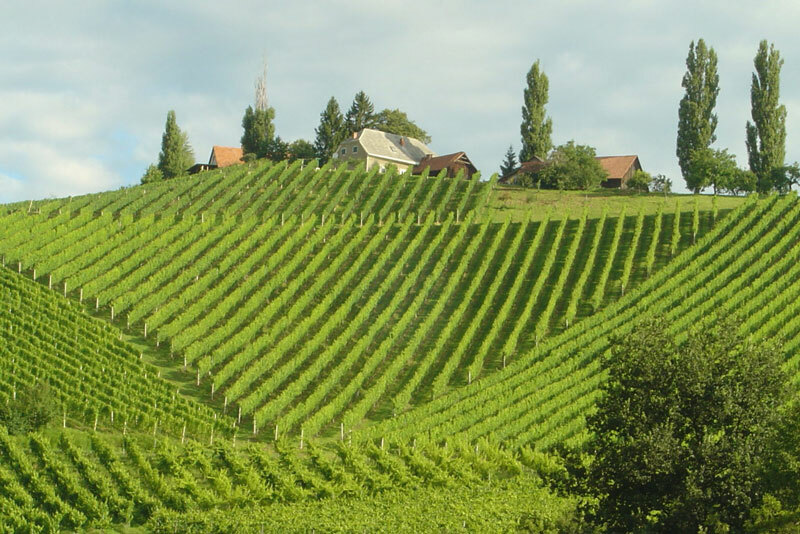 Sulz is among the warmest viticultural sites in Südsteiermark. The grapevines enjoy the warmth and light from the early morning to the late evening hours. The whole site is sheltered from the winds of the Koralpe mountain, and the cool air masses escape the valley toward the east. 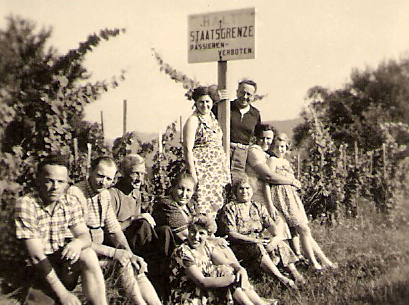 Our family purchased back then a smaller vineyard at Ried Sulz in 1962. Due to our good relationship with the neighbours, we were able to enlarge the vineyard step by step – if not row by row – to a larger piece of land. The name Sulz is derived from the nutrient-rich, water-absorbing soil formation of the site. It is said that people have grown wine here since the 13th century. Kittenberg in Sausal is our mother Ulrike’s home, located at a linear distance of some 12km from the winery. 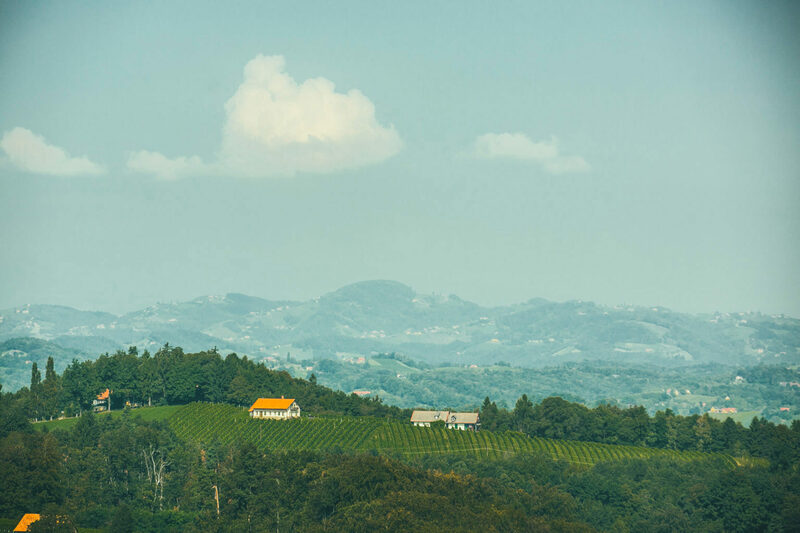 This site is cultivated by our aunt, uncle, and cousin and due to its schistose soil and proximity to the Styrian Prealps, yields a Pinot Blanc with a great mineraly taste and “cool” stylistics. Kittenberg is a steep, south-south-west facing hill with inclinations of up to 60%. It is situated at an altitude of approx. 450 meters. The age-old vines of the Kittenberg site are rooted in a geologically rare combination of slate and lime. It is responsible for the spiciness and mineraly character of the Pinot Blanc. The location between a sunny exposition and the colder air masses from the Styrian Prealps produces variety-specific Pinot Blancs of a “cooler” and more elegant stylistics. 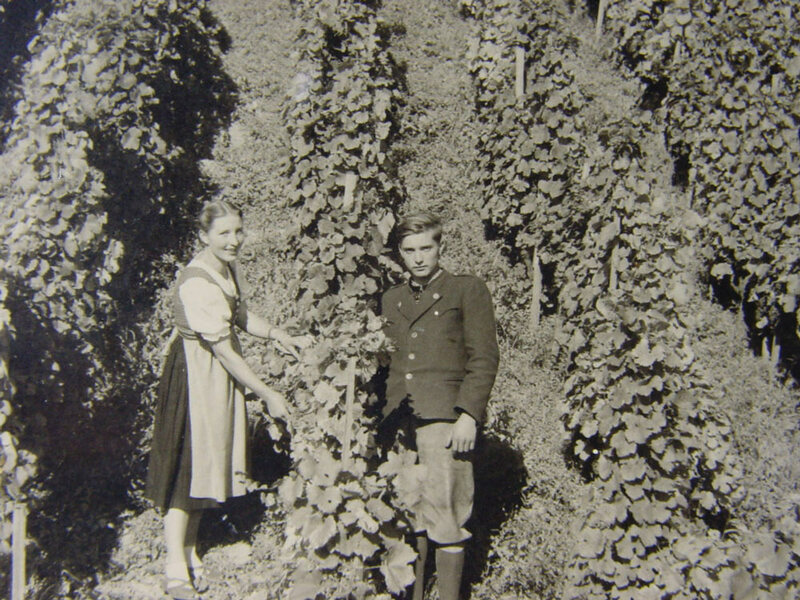 The Kittenberg was first mentioned as a wine-growing site in a written donation deed signed by the Archbishop of Salzburg. Its name is derived from “Kuhen” (ancient name for a mill) since this hill was known for the millstones that were cut here. The quarry is still visible today. We have been processing grapes from this site since 1982. Its wines have their own community of fans who appreciate its cool, mineraly, fine-meshed typicity.